Bamberger and Reform in Bavaria. Talmudist of the old school and leader of the Orthodox party in Germany; born at Wiesenbronn, near Kitzingen, Bavaria, Nov. 6, 1807; died at Würzburg Oct. 13,1878. His strictly Orthodox parents sent him, when he was fifteen years old, to the yeshibah at Fürth, where he pursued exclusively the study of the Talmud under Wolf Hamburger and Judah Löb Halberstadt. He was an eager and able student, and at the end of five years obtained his diploma as rabbi. In accordance with the olden pious standpoint, the idea of making a profession of the Torah did not enter Bamberger's mind; and he opened a general business store in his native town. Rabbinical studies, however, continued to be his chief employment. The following episode shows his enthusiasm for things spiritual: A customer once came into his place of business while he was deeply absorbed in his folios, and he called out impatiently: "Is there no other shop in this place, that you must come and disturb me?" —and continued his reading. When Bamberger left the synagogue early in the morning, he was wont to say: "If only no customers come to-day, so that I may not be bothered in my studies!" With such commercial principles it is no wonder that his trade decreased; and as his family grew larger, the capital with which he started—the dowry of his wife, daughter of Rabbi Seckel Wormser of Fulda, to whom he was married in 1829—dwindled away, and his business had to be liquidated. But Bamberger's reputation as a Talmudist and a zealous representative of Orthodoxy was ever on the increase; and while he was still atradesman, pupils came to him from all parts of Germany. Among them were some who later attained to prominence, especially in Orthodox circles. Through contact with his pupils, who prepared for the university while pursuing their rabbinical studies, Bamberger gradually came to see that a representative of Orthodoxy ought to have some knowledge of secular science also, though he himself possessed no systematic knowledge of the German language or of literature in general. Though no profound scholar, he was endowed with a fine tenacious memory which stood him in good stead in his endeavors to familiarize himself with what he called "secular knowledge." In 1836 the Bavarian government convoked an assembly of Jewish notables to report on various points in the Jewish religious law. The Orthodox staked their hopes on Bamberger, whom they delegated in place of Abraham Bing, rabbi at Würzburg, who was unable to represent them. It was chiefly due to Bamberger's energy and tenacity of purpose that the results of the meeting accorded with the wishes of the Orthodox party and not of the liberal-minded, who had expected much from it. 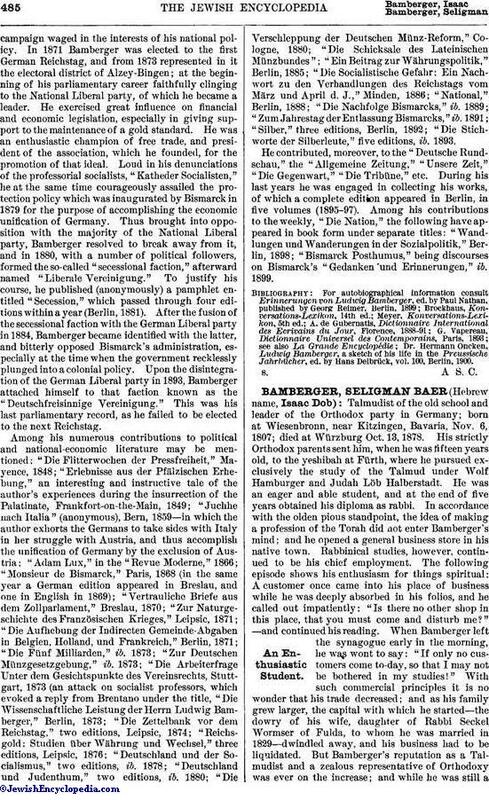 In consequence of his success, Bamberger's friends and colleagues begged him to become a candidate for the rabbinate of Würzburg, which Bing's death in 1839 had left vacant. By its choice of a rabbi, Würzburg, the seat of a university attended by many Jewish students of theology, would in a certain sense be a determining factor in the conflict between Reform and Orthodoxy. Bamberger's victory after a long and severe struggle had in fact been the triumph of Orthodoxy. 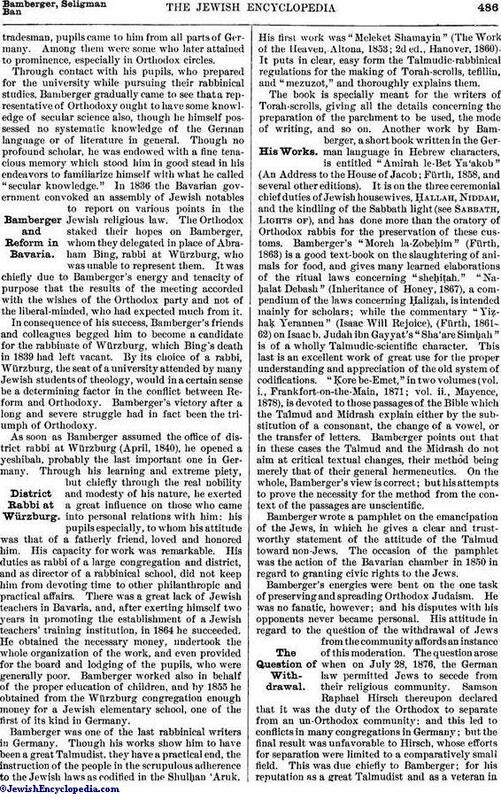 As soon as Bamberger assumed the office of district rabbi at Würzburg (April, 1840), he opened a yeshibah, probably the last important one in Germany. Through his learning and extreme piety, but chiefly through the real nobility and modesty of his nature, he exerted a great influence on those who came into personal relations with him: his pupils especially, to whom his attitude was that of a fatherly friend, loved and honored him. His capacity for work was remarkable. His duties as rabbi of a large congregation and district, and as director of a rabbinical school, did not keep him from devoting time to other philanthropic and practical affairs. There was a great lack of Jewish teachers in Bavaria, and, after exerting himself two years in promoting the establishment of a Jewish teachers' training institution, in 1864 he succeeded. He obtained the necessary money, undertook the whole organization of the work, and even provided for the board and lodging of the pupils, who were generally poor. Bamberger worked also in behalf of the proper education of children, and by 1855 he obtained from the Würzburg congregation enough money for a Jewish elementary school, one of the first of its kind in Germany. Bamberger was one of the last rabbinical writers in Germany. Though his works show him to have been a great Talmudist, they have a practical end, the instruction of the people in the scrupulous adherence to the Jewish laws as codified in the Shulḥan 'Aruk. His first work was "Meleket Shamayin" (The Work of the Heaven, Altona, 1853; 2d ed., Hanover, 1860). It puts in clear, easy form the Talmudic-rabbinical regulations for the making of Torah-scrolls, tefillin, and "mezuzot," and thoroughly explains them. The book is specially meant for the writers of Torah-scrolls, giving all the details concerning the preparation of the parchment to be used, the mode of writing, and so on. Another work by Bamberger, a short book written in the German language in Hebrew characters, is entitled "Amirah le-Bet Ya'akob" (An Address to the House of Jacob; Fürth, 1858, and several other editions). It is on the three ceremonial chief duties of Jewish housewives, Ḥallah, Niddah, and the kindling of the Sabbath light (see Sabbath, Lights of), and has done more than the oratory of Orthodox rabbis for the preservation of these customs. 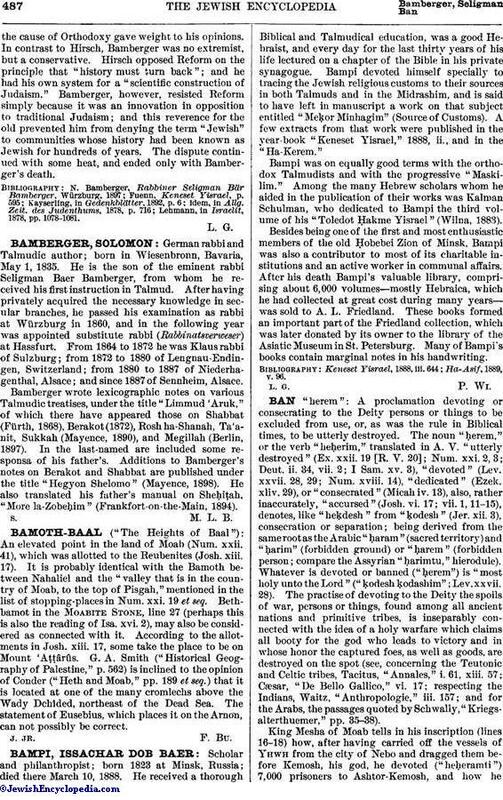 Bamberger's "Moreh la-Zobeḥim" (Fürth, 1863) is a good text-book on the slaughtering of animals for food, and gives many learned elaborations of the ritual laws concerning "sheḥiṭah." "Naḥalat Debash" (Inheritance of Honey, 1867), a compendium of the laws concerning Ḥaliẓah, is intended mainly for scholars; while the commentary "Yiẓḥaḳ Yerannen" (Isaac Will Rejoice), (Fürth, 1861-62) on Isaac b. Judah ibn Gayyat's "Sha'are Simḥah" is of a wholly Talmudic-scientific character. This last is an excellent work of great use for the proper understanding and appreciation of the old system of codifications. "Ḳore be-Emet," in two volumes (vol. i., Frankfort-on-the-Main, 1871; vol. ii., Mayence, 1878), is devoted to those passages of the Bible which the Talmud and Midrash explain either by the substitution of a consonant, the change of a vowel, or the transfer of letters. Bamberger points out that in these cases the Talmud and the Midrash do not aim at critical textual changes, their method being merely that of their general hermeneutics. On the whole, Bamberger's view is correct; but his attempts to prove the necessity for the method from the context of the passages are unscientific. Bamberger wrote a pamphlet on the emancipation of the Jews, in which he gives a clear and trustworthy statement of the attitude of the Talmud toward non-Jews. The occasion of the pamphlet was the action of the Bavarian chamber in 1850 in regard to granting civic rights to the Jews. Bamberger's energies were bent on the one task of preserving and spreading Orthodox Judaism. He was no fanatic, however; and his disputes with his opponents never became personal. His attitude in regard to the question of the withdrawal of Jews from the community affords an instance of this moderation. The question arose when on July 28, 1876, the German law permitted Jews to secede from their religious community. Samson Raphael Hirsch thereupon declared that it was the duty of the Orthodox to separate from an un-Orthodox community; and this led to conflicts in many congregations in Germany; but the final result was unfavorable to Hirsch, whose efforts for separation were limited to a comparatively small field. This was due chiefly to Bamberger; for his reputation as a great Talmudist and as a veteran inthe cause of Orthodoxy gave weight to his opinions. In contrast to Hirsch, Bamberger was no extremist, but a conservative. Hirsch opposed Reform on the principle that "history must turn back"; and he had his own system for a "scientific construction of Judaism." Bamberger, however, resisted Reform simply because it was an innovation in opposition to traditional Judaism; and this reverence for the old prevented him from denying the term "Jewish" to communities whose history had been known as Jewish for hundreds of years. The dispute continued with some heat, and ended only with Bamberger's death. Lehmann, in Israelit, 1878, pp. 1078-1081.